Go to Cornwall on Route 138. Cross bridge into NY State. Take Route 37 East to Malone and then Route 30 South. Turn left at Paul Smith’s College onto Route 86. Follow Route 86 to Lake Placid. Just after you pass the “Welcome to Lake Placid” sign (on your left), take a left on to Whiteface Inn Lane. Drive just over a mile and make a right hand turn into our driveway. Take Interstate 90 (NYS Thruway) to Syracuse Exit 36. Take Interstate 81 North to Watertown. Take Route 3 East to Saranac Lake. Take Route 86 East to Lake Placid. Just after you pass the “Welcome to Lake Placid” sign (on your left), take a left on to Whiteface Inn Lane. Drive just over a mile and make a right hand turn into our driveway. Take Interstate 87 South to Exit 34. Take Route 9N South to Route 86 West to Lake Placid. Follow Route 86 through Lake Placid. You will pass Cold Brook Plaza on the right. Just beyond this plaza, also along the right, you will see our sign, “Whiteface Club.” Make a right on to the Whiteface Inn Lane and drive just over a mile. Make a right hand turn into our driveway. Take Interstate 87 North (NYS Thruway) to Albany, Exit 24. Follow signs for Interstate 87 Northway and take it north to exit 30. Bear left onto Route 9 and follow it for 2 miles to Route 73. Follow it for about 28 miles. Take Route 86 West through Lake Placid Village. At the High Peaks Resort, bear left (up the hill) and continue on Route 86 West for approximately one mile. You will pass the Cold Brook Plaza on your right. Just beyond this plaza, also along the right, you will see our sign, “Whiteface Club.” Make a right on to the Whiteface Inn Lane and drive just over a mile. Make a right hand turn into our driveway. Get on Interstate 89 North to Exit 17 (Champlain Islands). Go North on Route 2 to Champlain Islands (So. Hero, Grand Isle). In So. Hero Grand Isle take left at blinking lights, follow signs to ferry. Take the ferry. In Cumberland Head, NY, follow signs to Interstate 87 South and take that to Exit 34. At Exit 34, take Route 9N South to Route 86 and Route 86 West to Lake Placid. Follow Route 86 through Lake Placid. You will pass Cold Brook Plaza on the right. Just beyond this plaza, also along the right, you will see our sign, “Whiteface Club.” Make a right on to the Whiteface Inn Lane and drive just over a mile. Make a right hand turn into our driveway. Burlington-Port Kent Ferry: In Port Kent, follow signs to Route 9 until 9N. Take 9N to Jay. In Jay, take Route 86 to Lake Placid. Follow Route 86 through Lake Placid. You will pass Cold Brook Plaza on the right. 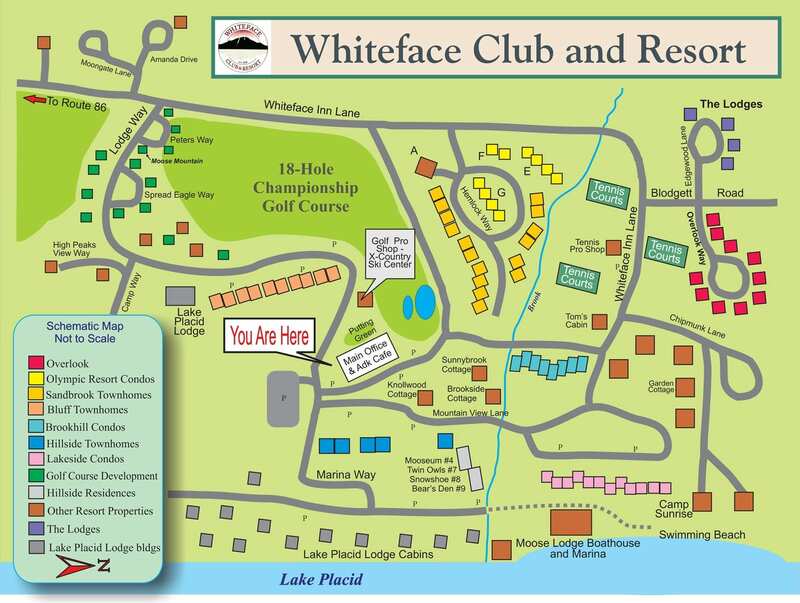 Just beyond this plaza, also along the right, you will see our sign, “Whiteface Club.” Make a right on to the Whiteface Inn Lane and drive just over a mile. Make a right hand turn into our driveway. Charlotte-Essex Ferry: In Essex, follow signs to Elizabethtown (or Route 9N). In Elizabethtown, take Route 9N to Route 73 (towards Keene). Follow Route 73 North into Lake Placid until you meet Route 86. Take a left on to Route 86 West through Lake Placid Village. You will pass the Cold Brook Plaza on your right. Just beyond this plaza, also along the right, you will see our sign, “Whiteface Club.” Make a right on to the Whiteface Inn Lane and drive just over a mile. Make a right hand turn into our driveway.